Autodesk software is the cornerstone of many industries whether it be simple old AutoCAD, the might of Revit in the BIM space, their dominance in 3D Modelling with 3ds Max and Maya or their suite of other apps. 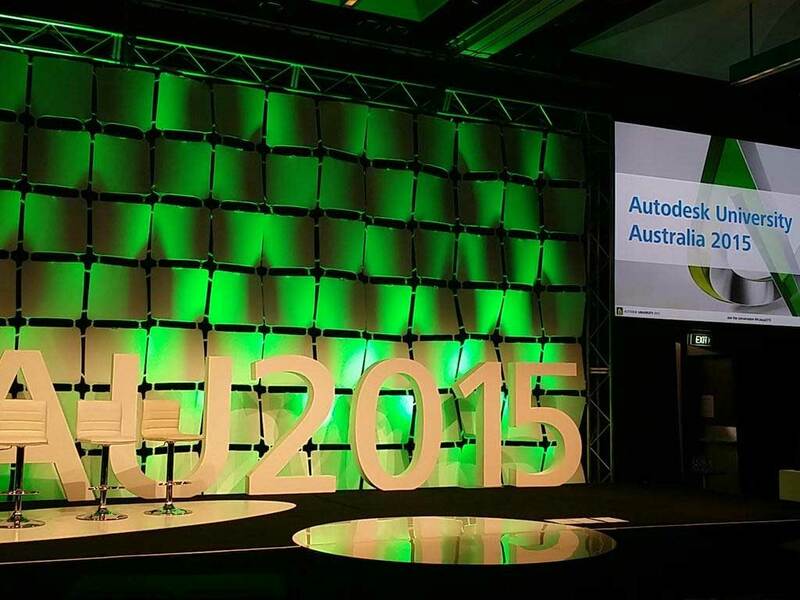 This was the second year that they have brought their Autodesk University event to Australia and I really enjoyed both days. Day 1 was all in the big hall with the keynotes and customer stories for all the attendees in one hit. There were several Autodesk speakers mostly covering industry trends and where Autodesk is taking their products to meet the changes and the future. Things kicked off with a lights and dance show where the two dancers’ LED suits and batons were all digitally synced and doing pretty cool stuff. What the presentations really showed me was that there are people doing some amazing things in terms of process for design. Whether it is the kids in the F1 in Schools Challenge or Woods Bagot‘s Architects generating solutions to complex design problems the theme of the ‘future of making things’ was pretty strong. The idea that teams are more virtual, that the cloud can give you all the compute you need, that small teams can come together to create things quickly and cleverly are all disruptive. Apart from the sessions, we had the industry floor which was small but still interesting. Laser scanners, 3D printers and 3d party software to deal with mapping data were all on display along with some exemplars of simulation, art and generation. Day 2 was split into tracks covering Buildings, Infrastructure, Manufacturing, Media and Entertainment and General. I spent my time in Buildings and Media and Entertainment seeing the power of point cloud data and game engines. Some of the software of note: Momento, Shotgun, Stingray, Showcase, CFD, Recap, Python and SketchbookPro. I have a bunch of people to follow up with and ideas to think through following the event which is good. Seeing what people are actually able to do with these tools is great for inspiration. Oh and it was interesting that despite the heavy emphasis on Windows based software there were plenty of Mac about. These people have just become used to running Windows on their Mac – still not exactly sure why really, but that is what I saw.